YANGON, Myanmar (CNN) -- The Myanmar court trying opposition leader Aung San Suu Kyi adjourned for the weekend after hearing from the lone defense witness in the case, a spokesman for Suu Kyi's political party said Thursday. The court examined Kyi Win, a Suu Kyi lawyer, for about three hours Thursday, said Nyan Win, a spokesman for the National League for Democracy. The judge then said the court would start again Monday. The judge has asked both sides to submit their summarized arguments by Monday, the party spokesman said. Suu Kyi, 63, is being tried on subversion charges after an American man swam to her house and stayed overnight in violation of the terms of her long-running house arrest. 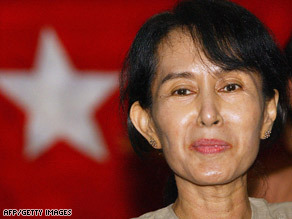 If convicted, Suu Kyi could be sentenced to three to five years in prison. The court heard testimony from the man, John Yettaw, on Wednesday. The 53-year-old former U.S. military serviceman from Falcon, Missouri, testified repeatedly that God had sent him to Myanmar to protect Suu Kyi because he had a dream that a terrorist group would assassinate her. Yettaw swam to Suu Kyi's home May 3. The government says Yettaw's presence violated the conditions of Suu Kyi's house arrest. Suu Kyi testified this week that she was unaware Yettaw was at her home until the next morning, when she tried in vain to get him to leave. She gave him some food and permitted him to spend the night before he departed on May 5, she said. Yettaw is charged with violating immigration laws and trespassing. The charges carry a maximum sentence of five years in prison on conviction. Her latest round of home detention -- after five years of confinement -- expired Wednesday, according to her supporters at home and abroad. Myanmar's ruling junta, however, says Suu Kyi's house arrest does not expire for six more months. Suu Kyi's attorneys reject that explanation, saying the United Nations has deemed the opposition leader's continuing detention unlawful under Myanmar's state protection laws. Her supporters say the trial is meant to keep her confined even longer -- beyond the general elections that the junta has scheduled for next year. The political party spokesman has complained the court is violating Suu Kyi's rights because the judge rejected three of four defense witnesses. Kyi Win is the only witness the court allowed for the defense; the judge did not explain why he was the only one permitted to testify. In contrast, the spokesman said, the court rejected nine of 23 government witnesses. CNN's Kocha Olarn in Bangkok, Thailand, contributed to this report.